Last night I dreamed of my dog Gracie, who passed away peacefully in December 2014. It was a peaceful dream – she was old in my dream, as she was before she died. I felt as though she was holding on for me and my ex. She was such a kind, sweet dog…perhaps the best dog I’ve ever known…and I’m not just saying that because she was mine. She truly was a remarkable soul. In the dream, she came out of my old bedroom to say “Hello” and then went back to her bed. I awoke in the arms of my boyfriend and reached for my phone, as I always do. 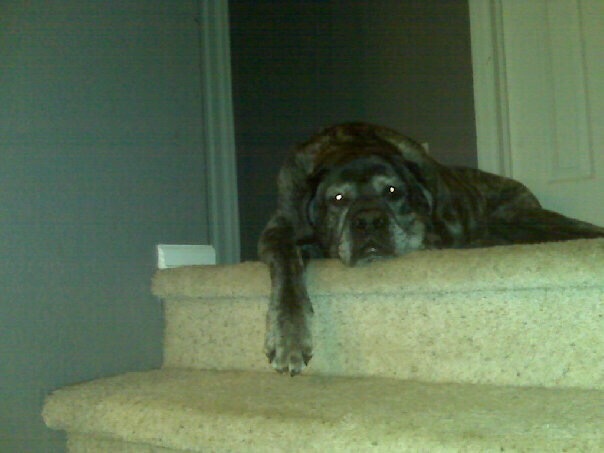 The first thing I did was open my Facebook to clear my notifications, the first picture I saw was a memory from 7 years ago…it was a picture of Gracie, resting peacefully on the top of the stairs. Coincidence? I just don’t believe in coincidences anymore. For more stories of my bizarre, spiritual visitations, check out my short story, “The Reluctant Medium” on Amazon.